The stories we hear or read in childhood tend to stay with us for the rest of our lives. They infect our dreams while coloring our expectations for all future narratives. Some of this is because we are so impressionable at a young age. Some of it is because childrens’ stories tend to boil ideas down to their most basic essence, tales that are relatable and explanatory for decades beyond the time when we first hear them. You don’t have to subscribe to Jung to believe Hansel and Gretel tells a classic story about the dangers of separation from your parents. The first adult book I ever read was The Hobbit. I remember the green-backed edition I plucked from my parents’ bookshelf at a precocious age. It was absolutely entrancing. I didn’t go in for the songs or lengthy lyric poems all that much, but the underlying story about a reluctant hero on a journey to defeat a dragon really spoke to me. Tolkien’s writing is both accessible and sophisticated at the same time, with layers of meaning that get deeper as you get older. When you reach middle age, the call to adventure feels especially strong. You ask yourself if you are just making tea and getting by, or if you might be willing to risk it all for some crazy journey based on the recommendation of a wizard. And it’s Saturday night, so why not? 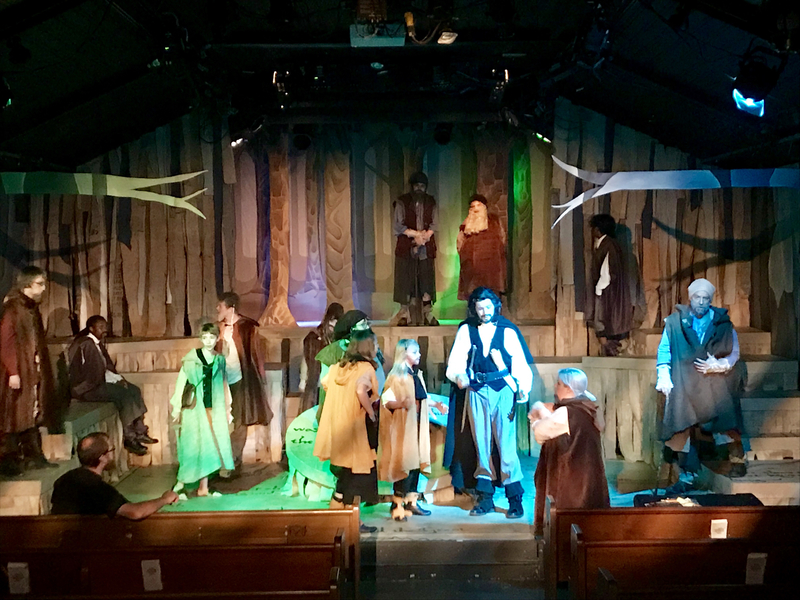 The Cloverdale Playhouse’s production of The Hobbit integrates their programming for young people with their regular season of provocative and smart plays. And the cast of the current production is integrated as well, with a number of young people sharing the stage with their older counterparts. The play itself relies on the stage presence of a band of dwarves, well played by a group of young folks wearing facial hair that’s made of yarn, spray paint, and other mechanisms. They slouch up and down the set’s steps, lending a kind of Greek chorus feel to the whole production. While the band of travelers deserves accolades, an unsung star of the production is the set. At first glance, it’s a simple layout, but as the story evolves, it reveals itself as more than up to the task of making simple scenes complex. There are cool shadows projected behind that give the sense of movement. There is a clever illusion of jail cells. The same basic layout becomes a canvas for a dragon. And the puppets that form the trolls and dragon are really cool, with the humans behind them visible but somehow secondary to the figures they are representing. We’d wondered how they might do the tale’s famous dragon, and we were not disappointed. The voice was a really simple but memorable effect. Although the adaptation distills a far-reaching novel to its core, there are still a tremendous number of lines to be learned. As Bilbo, Sophia Kessler has the most to learn, and she recites them impeccably. So far removed from his home, the titular hobbit must find a way to help his squad of dwarves to burgle the dragon. Gandalf (Jacob Holmberg) helps as he is able, directing with a distinctive voice the action throughout the company’s journey. There are comic turns from several dwarves, and the whole cast functions well together as they pull you in to the light-hearted spirit of the production. Introducing the show, Cloverdale Playhouse artistic director Sarah Thornton mentioned that this is the largest production that the theater has ever put on. The stage is crowded at times, but it speaks well to the entire cast (and the choreography and blocking) that people move seamlessly around without bumping into each other. It’s physically very well orchestrated and a great use of space. One favorite part of the play is Bilbo’s interaction with Gollum, played with great energy by Landon Perdue. It’s a very memorable contest of riddles, in which Perdue makes the most of the stage set to lurk around the invading hobbit in a genuinely menacing manner. In the end, the production is a wonderful confection that makes you think about the stories you’ve been told and how they affect your expectations of what’s possible. You can leave your house in search of adventure. The dangers of the forest won’t take you. Other groups of people will learn to work with you. The dragon will be slain. We deserve stories that set such high expectations. This production of The Hobbit provides joy in the everyday in service of a narrative that embraces the broad reach of time. We are all trying to slay our own dragon. Here, at least for a few hours in the company of some very young but capable actors, you can rejoice in that possibility. The Hobbit will run at Cloverdale Playhouse until July 29. Tickets are available here or by calling the theater box office at 334-262-1530.